For some, the term “going to the dogs” is actually a good thing, such as Northern Pet Products, Inc., a Concord, Ont. family-owned company that has quite literally grown its business from within their own family kitchen to where it is now one of the great Canadian success stories with happy dogs around the world. In 1992, after a failed effort to find a healthy treat that their finicky American Eskimo puppy dog Tasha would eat, company co-founders Patricia and Nick Grillo, decided they would try and create something themselves. Armed with a bag of Canadian flour and some fresh beef liver, they went to work. The concept of creating their own treats for a dog wasn’t that far out there, as company president Patricia Grillo was already making homemade baby food for her two very young toddlers, as well as food for herself and her husband chief executive officer Nick—so she made it a perfect trifecta and went about creating something healthy for the pooch as well. Being neighborly, she sent some extra dog cookies from her second batch to Max, whose owner stopped by a few days later to say that his dog was constantly salivating by their own ‘cookie cupboard’, and wouldn’t move until he got one of the liver biscuits. “That’s when I knew I might have stumbled onto something,” Patricia smiles. 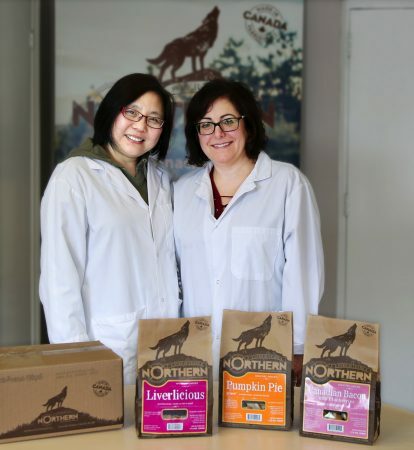 Northern Pet Products packaging supervisor Maria Wu (left) and company president Patricia Grillo with three examples of many flavor varieties offered by the Concord, Ont. company, growing from a home business baking in a small kitchen to an international healthy dog biscuit business with some 64 SKUs at its 14,000-square-foot facility. After giving out samples to family and friends with dogs, she was soon baking to order. Possessing that wonderful homecooking mentality, she began packing the dog biscuits in economical but classical brown paper lunch bags—a look that has stayed with the now national company, making it instantly recognizable on the pet food shelves. Even with the quick success, Patricia Grillo was still working out of her home kitchen, with her and hubby Nick working together to make and bake the treats in the family oven in their small family apartment in Toronto. With the apartment transformed into a small bakery, they used a small hand-held mixer, small meat grinder, placed extra racks in the oven to bake more in one go, and turned their young son’s bedroom into a walk-in cooler leaving the window open in his room to let the cold air in. The Grillo’s laugh as they recall how in the early days of baking the healthy dog biscuits involved having toddlers walking through their feet, an anxious dog smelling all the cookies, and having to stand up and eat their meals because the dining room area was replete with drying racks, “And while challenging, it was a very rewarding time,” says Patricia Grillo. After grabbing a table at the St. Jacobs weekly farmer’s market, they placed their all-natural dog biscuits in paper bags, much to the chagrin of the more established crew of vendors selling their arts, crafts, foods and beverages. But despite the 4 A.M. wake-up calls to drive from Toronto to set-up and sell at the market, the Grillo’s discovered that week after week they were receiving return business. On the way home, they would stop off at the country stores lining the roads and try and convince someone to stock their shelves—with the famous Apple Factory Farm Market in Brampton, Ont. taking a leap of faith by purchasing 12 bags of their now branded Northern Biscuits—an homage to their pride in Canada. The Apple Factory is a small, family-run market that specializes in organic, natural baked goods, fruits and vegetables—and their faith was rewarded. Soon after, pet food stores began calling telling the Grillo’s that people were asking for Northern Biscuits. 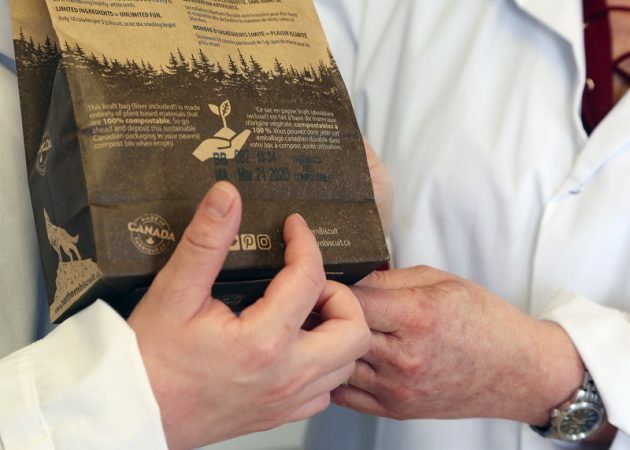 Examples of the larger 500-gram kraft paper bag package, and the 190-gram pack, are individually coded before being hand-packed into master cases, which are then coded by a Squid Ink CoPilot system for Northern Pet Products, sold to them by Dependable Marking Systems of Oshawa, Ont. Almost immediately, however, Nick Grillo’s work wanted to transfer him to Halifax, Nova Scotia, and within the week the family was out on the east coast looking at possible residences. “My mind, however, was already made up when we returned to Ontario,” says Patricia Grillo. “But it was finalized for both of us when we heard all of the messages on the answering machine chastising us for not having a supply of the Northern Biscuits available for the dog-owners, especially before Christmas. “Nick quit his job, but that’s okay, because now he had a full-time job making the dog biscuits,” recalls Patricia Grillo. Now aware that going into business full-time producing the healthy dog cookies, the family thought about renting a facility and purchasing the processing equipment—things that cost money they didn’t have. But because this is a success story, after all, the Grillo’s caught a break. Earlier that year, their two-year-old son had been chosen to play a role in a national television commercial and the monies earned from it allowed the Grillo’s to physically start up their business in a small bakery space in Woodbridge, Ont. in 1993, getting them out of their Toronto condominium. In 1995, the company moved to its current location in Concord, taking over a single unit. In 2000, Northern Pet Products took over an additional two units in the same building, expanded again in 2008 to 8,000 square feet, and lastly at the end of 2017, they took over every unit within the building, now occupying a robust 14,000 square feet. A controller for the Squid Ink AutoPilot, sold via Dependable Marking Systems, shows the type of data to applied via the coder to product packaging: time of manufacture, a four-year best-before date, lot code data, and a message indicating that the bag is 100 percent compostable. According to Patricia Grillo, company growth hasn’t changed the way they go about their business, as they still utilize fresh, local Canadian meats, flours and other ingredients. “We always source for the freshest, food-grade meats and vegetables from Canadian growers,” she notes, adding that most of fresh ingredients they use are grown within a couple of hours from their bakery. It’s all part of its key plan to maintain the spirit of the original recipe, but to expand its product range where it now has some 64 SKUs (stock-keeping units). 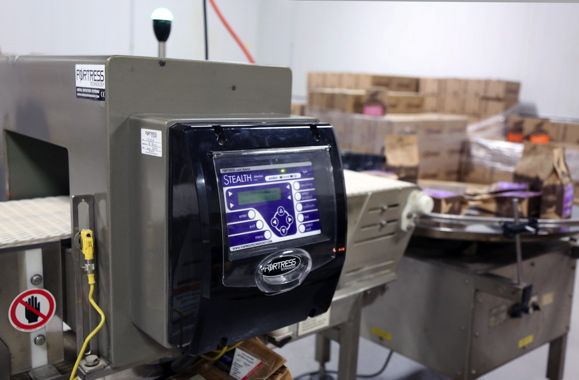 The AutoPilot at work, quickly and quietly applies the coding data to the back of a bag of Northern Biscuits brand healthy dog treats at the fast-growing Northern Pet Foods facility in Concord, Ont. 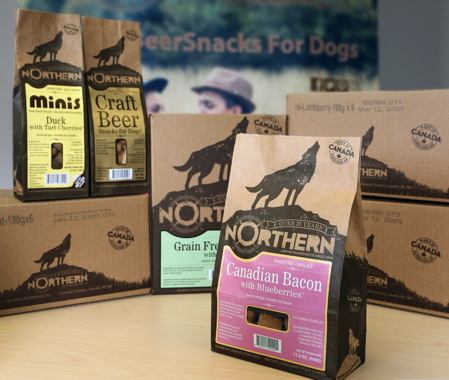 Northern Pet Products has three basic food package sizes for its Northern Biscuits brand: 190-grams, 500-grams, and 1.5-kilogram versions, with specific brand types: Wheat-Free; Grain-Free; Functional (promoting specific dog health solutions); Mini; Dental, and a Soft & Chewy version. Flavor-wise, Northern Pet Products is quite diverse, offering tasty treats that will leave you wondering if your dog isn’t indeed eating better than you: Peanut Crunch! ; Liverlicious; Lamb Berry; Canadian Bacon with Blueberries—the company’s best-seller; Pumpkin Pie; Turkey Cranberry; Peanut Banana with Cinnamon; Grilled Venison; Smoked Fish with Blueberries; Grain-Free Bison with Blueberries; Salmon with Kelp; Venison with Apple; Bison with Blueberries; Sweet Potato with Cranberries; Duck with Tart Cherries; and Craft Beer. It’s no wonder that Northern Biscuits is one of the top-selling premium brands of healthy dog treats in North America, and growing. Northern Pet Products bakes its dog biscuits to order in small batches, which Patricia Grillo says enables the bakers to concentrate on quality. “It’s true that our biscuits will sometimes vary in color and or size from batch to batch,” she says, “but that’s because fresh food ingredients can vary from herd to herd or crop to crop. 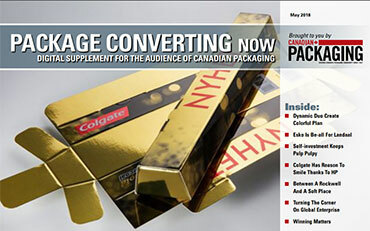 Another way the company stands out is with its packaging, opting for the most part to keep things as simple as possible. “We started our sales by packing the biscuits in pre-printed, stand-up paper bags, and while we have expanded on that, the look is still pretty much the same,” says Patricia Grillo. For the 500-gram packs, the Northern Biscuits brands are sealed in kraft paper packaging—6” x 2.75” x 9.75” stand-up pouches meant to resemble paper lunch bags. These 60-pound kraft paper packs feature a PLA (polylactic acid) liner and window, affording a clear view of the dog biscuits inside. The smaller 190g 3.5” x 2.375” x 10” Junior bags are also made of 60-pound kraft paper with a PLA liner and clear window. The PLA liner is a biodegradable and bioactive thermoplastic aliphatic polyester made from renewable resources such as corn starch, cassava root, chips, starch or sugarcane, which makes the entire empty package 100 percent biodegradable. According to Nick Grillo, the company currently complies to CFIA/USDA (Canadian Food Inspection Agency/United States Department of Agriculture) standards for export into the U.S., and are currently in the midst of establishing manufacturing practices to achieve SQF (Safe Quality Food) compliance within the next 12 months. “Our process begins with fresh ingredients, meats and fish which we grind on site, that are added to a mix that is baked, cooled, packed and palletized for shipment,” Nick Grillo explains. While the manufacturing process can best be described as semi-automated, helping Northern Pet Products with its automation are a pair of coders manufactured by Squid Ink, and sold to them via Dependable Marking Systems Limited, an Oshawa, Ont.-based international sales company of high-quality marking equipment for use on a wide range of products and containers. Incorporated in 1986, along with its coding offerings, Dependable Marking also provides labeling and case sealing equipment, and like its company moniker suggests, provides dependable service to its customers. Squid Ink operates as a subsidiary of Engage Technologies Corporation, parent company to Squid Ink, Eastey Enterprises, AFM, and Cogent Technologies. 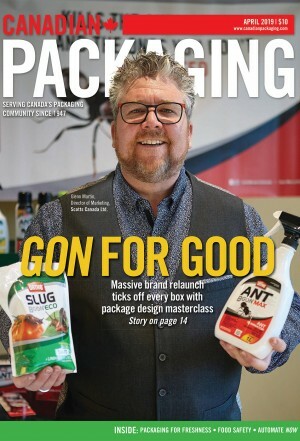 Northern Pet Products purchased its first Squid Ink marking unit three years ago—a solvent-based AutoPilot to replace a hot stamp bagger purchased elsewhere, giving itself a less expensive coder possessing more flexible print options than standard continuous inkjet printers. 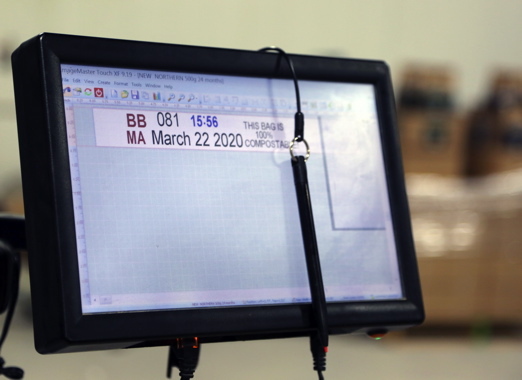 The AutoPilot system is used by Northern Pet Products to print the date and time of the content’s production, as well as lotcode information onto the back of its individual kraft paper bags and paperboard boxes. “The AutoPilot printing system features a rich, high-resolution printing system available at an entry level price, something a still-small company like Northern Pet Products appreciates,” explains Dependable Marking Systems’ vice-president of sales Dave Frenette. With the AutoPilot, users are able to print up to 0.7-inches (1.8 cm) of high resolution characters, razor sharp text, scannable bar codes, and even logos, with a 180 dpi (dots per inch) print resolution for excellent quality coding and marking up to a rate of 135 feet/minute (41 meters per minute). The AutoPilot features a durable full-color touchscreen user panel, and has a industrial strength resin printer construction, meaning it can work well even in harsh factory environments without clogging up the printheads. Liking what they saw from Dependable Marking Systems, in 2017 the Grillo’s purchased a second AutoPilot—oil-based—for case printing. 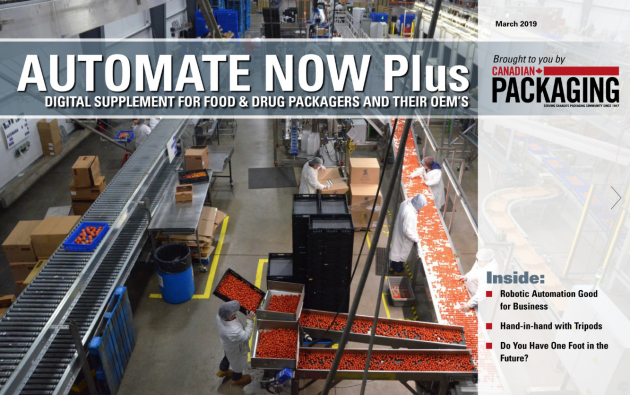 Frenette says that the company is now trying out a CoPilot 382—a demo machine—mounted atop the Eastey conveyor, where it applies lot code data to the corrugated shipping cartons converted by McLeish Corr-A-Box. A CoPilot 382 manufactured by Squid Ink is mounted on an Eastey EC1248 conveyor applying product identification data after exiting an Eastey SB-2 Taper unit, which were all supplied to Northern Pet Products by Dependable Marking Systems. According to Frenette, the CoPilot 382 is a merely “test” machine in lieu of an incoming new CoPilot 500 that will provide a larger barcode area for marking on the cartons as demanded by the Northern Pet Products’ customers. Frenette says that the CoPilot 500 has replaced the CoPilot 382 as the top-end printer for Squid Ink, as far as print size, line speed and mounting options go. 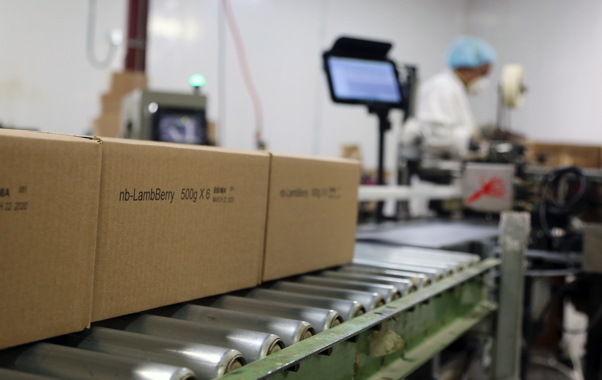 Clearly printed cases marked by a Squid Ink CoPilot 382—from Dependable Marking Systems—containing Northern Pet Products Lamb Berry healthy dog biscuit packs are ready for delivery to customers. The CoPilot 500 printing system is designed to print superior quality, high resolution characters on porous substrates, and thanks to its Piezo impulse printhead technology, it always provides sharp resolution up to a print height of 2.8 inches (7.1 cm). It can also be run with an additional print head allowing the user to print front and back, if needed. The CoPilot 500 prints at 185 dpi, providing sharp, easy-to-read marking. As well, the CoPilot 500 comes with an easy-to-use 4.3-inch (10.9 cm) full-color touchscreen that provides easy access to its internal message and print functions. The messages are created and edited on Squid Ink’s Orion PC Software and transferred via USB, Ethernet, wireless or even Windows tablet. 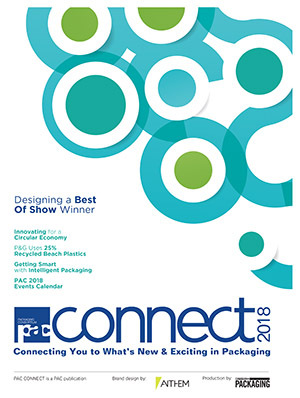 For porous substrates such as the corrugated cartons used by Northern Pet Products, Squid Ink’s PZ-1000 ink offers low-maintenance performance, eliminating the need for auto-priming functions, and has better ink utilization than competitive systems. 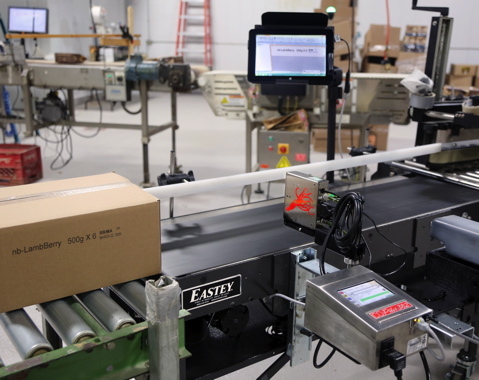 The coding machines both utilize conveying systems—built by sister company Eastey—for smooth distribution along the production line. “We have been very impressed by the Squid Ink machines, and are thankful to Dave at Dependable Marking for introducing them to us,” says Nick Grillo. “Not only do they produce a very legible ink that the customer can easily read, but both machines are very easy for our operators to use,” he adds. 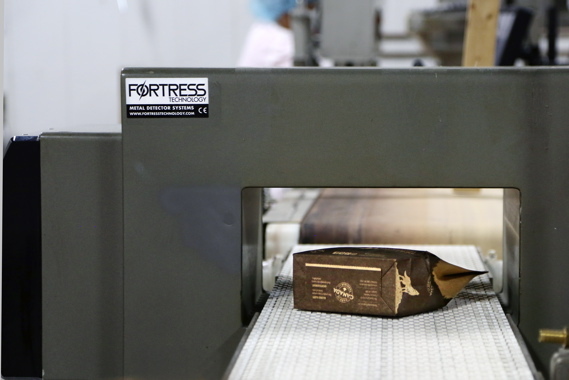 The bakery uses a Stealth metal detection unit manufactured by Fortress Technology, providing Northern Pet Products with an additional comfort level regarding the safety of its healthy dog biscuits, thanks to the system’s highly-sensitive digital signal processing tech. (Below) A view of the Stealth’s control panel. For additional safety, Northern Pet Products uses a Stealth metal detection system manufactured by Fortress Technology, a Toronto-based global designer and manufacture of top-quality metal detection systems. The Stealth units are custom-manufactured to suit any application. It uses digital signal processing technology and has a very high sensitivity range for ferrous, non-ferrous and stainless steel contaminants. 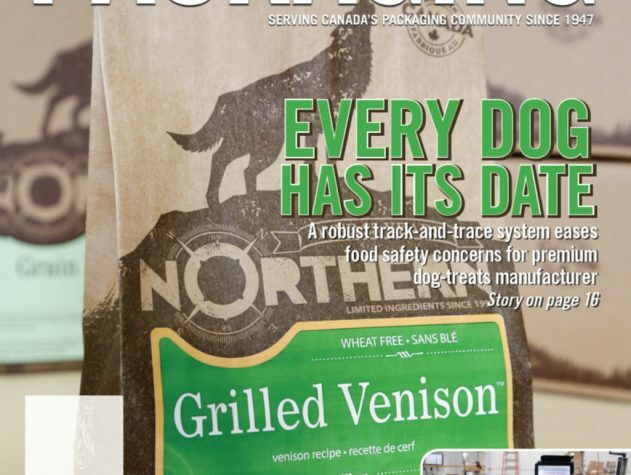 For traceability, the Stealth also uses built-in data software—something that is very handy for Northern Pet Products as it furthers its food security standards. 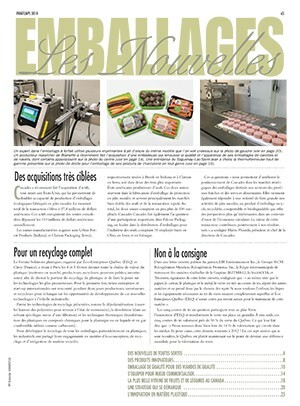 Regarding the company’s Squid Ink coders, Patricia Grillo is effusive in her description of the machines purchased via Dependable Marking Systems: “As far as attaining the manufacturing standards we are hoping to achieve within the year, the traceability aspect we are able to achieve via the Squid Ink coders is extremely important. “No one wants anything bad to ever happen, but should a dog become hurt or sick, it is extremely important that we can go back to the exact time the product was made with the code applied on each bag by the AutoPilot to affect a proper investigation and recall, if necessary,” she notes. “Dependable Marking has helped us every step of the way.